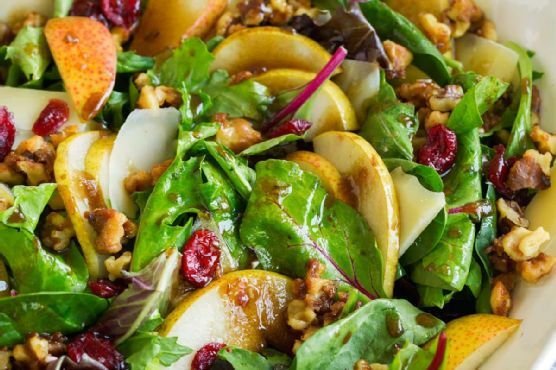 If you have about 15 minutes to spend in the kitchen, Autumn Pear Salad with Candied Walnuts and Balsamic Vinaigrette might be a tremendous gluten free recipe to try. One serving contains 375 calories, 7g of protein, and 28g of fat. This recipe serves 5 and costs $1.57 per serving. This recipe from Cooking Classy requires extra virgin olive oil, walnuts, light-brown sugar, and dijon mustard. It works well as a side dish. 1 person were glad they tried this recipe. Taking all factors into account, this recipe earns a spoonacular score of 57%, which is pretty good. Users who liked this recipe also liked Pear & Arugula Salad with Candied Walnuts, Pear Salad with and Bacon, Gorgonzolan and Candied Walnuts, and Pear, Arugulan and Endive Salad with Candied Walnuts. Dried fruit can be expensive, especially if you opt for organic. Your own dehydrator could be a great investment if you eat dried fruits regularly!